CUSA would like to welcome and introduce one of this year’s incoming doctoral student researchers, Tera Dornfeld. Tera a first-year Ph.D. student in the department of Planning, Policy, and Design. She is trained as a biologist, receiving her BA in Biology from Cornell College and MS in Biology from Purdue University. Tera’s previous research at the Las Baulas Research Project in Playa Grande, Costa Rica, initiated the first-ever study of the nesting ecology of the local olive ridley sea turtles in the area. Not only focused on sea turtles in Playa Grande, she also served as outreach coordinator to the community, working to translate biological information to the community through innovative outreach and education programs. 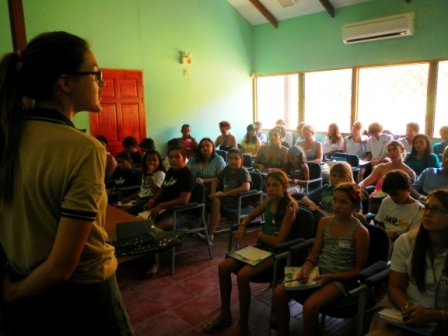 Tera answered a few questions about her background, motives, and involvement with CUSA as she currently continues her sea turtle research with The Leatherback Trust at the La Paz Community School in Playa Flamingo, Costa Rica. Q: Why did you decide to get join the Center for Unconventional Security Affairs? A: I departed the study of biological science (working at a sea turtle conservation project) to enter the study of social science. This move was fitting, as I was eager to understand how to involve people in the resource conservation matters I worked on as a biologist. CUSA will allow me to merge my previous work in biology with my new interest in the role of people in conservation. Q: How do you think your work aligns with CUSA’s overall mission? A: My work aligns with the mission of CUSA because I am interested in applied research that can be used to design conservation projects that will preserve and project resources so those resources will be available to meet the needs of current and future generations. Specifically, I hope to study how conservation can be done more effectively by understanding how to better collaborate with diverse stakeholders at the community level. By working with diverse, community stakeholders, I hope to that more community members will become invested in the conservation of resources. I foresee investment that includes the advocating for more stringent policies related to resource conservation as well as participating in research efforts about the dynamics underlying environmental problems and with conservation projects. Q: What projects will you be working on with the center? A: Though I have not yet determined a specific research focus, I hope to study community involvement with issues related to water conservation or mitigation of plastic contaminants in the marine environment.I am interested in work with citizen science and the ‘California King TIdes’ project as well as work to fight marine plastic pollution with 5 Gyres. Q: What do you hope to accomplish while at CUSA? A: While at CUSA I want to build my research experience by participating in diverse projects associated with the research center. I also want to become a part of an academic community where I can collaborate with other CUSA researchers and have opportunities to share my work with other professionals.